Education and Expense: The Barriers to Mass Spectrometry in Clinical Laboratories? | Technology Networks Education and Expense: The Barriers to Mass Spectrometry in Clinical Laboratories? Education and Expense: The Barriers to Mass Spectrometry in Clinical Laboratories? Mass spectrometry (MS) in clinical laboratories has a reputation for being both time intensive and costly. These are two potential factors that have influenced the lack of take-up of the technology. However, recently, there has been a marked shift: it is not just vendors talking about MS, but also the clinical laboratories themselves. Does this mean that MS is becoming more widely accepted in a clinical setting? This article will explore why this shift has occurred and why it has taken so long. Why is this a hot topic now? MS has been in clinical laboratories for years, for example gas chromatography (GC) MS and MALDI-TOF. Tony Lewtas, Senior Marketing Communications Manager at Bruker Daltonics clarifies that ‘there is one area of clinical medicine where MS has not only been successfully introduced, but is also now established as the technique of choice for routine testing. It is the application of MALDI-TOF in the clinical microbiology lab – and it may serve as a model for other MS techniques, in other clinical disciplines.’ However, users often do not consider these as MS and this may be down to clever branding (for example with Bio-Merieux’s VITEK: a MALDI-TOF) and lack of education. When people talk about the lack of MS in this context, they are generally referring to liquid chromatography (LC) MS, which has been shrouded in fear for clinical labs. The Freedom EVO® positive pressure SPE workstation allows complete process automation of SPE workflows in clinical and toxicological laboratories involving industry standard SPE cartridges. The system alleviates the constraints of performing SPE manually providing major time and cost savings as well as offer complete data traceability addressing quality compliance concerns. What Are the Perceived Barriers to MS? Fear of MS in clinical laboratories stems from the fact that, until recently, the technology was complex and required specialist skill. Furthermore, current technology, such as immunoassays, were just good enough for the needs of clinical scientists. Therefore, there has been no drive to adopt a new technology such as that seen in the life sciences sector. Edwards added that ‘Front-end automation…is only half the battle’. The volumes of data generated in even a small laboratory are immense. ‘Taking an admittedly limited case - looking at 100 samples a day for 50 compounds, where each compound is monitored by two ion transitions - means that someone's job is to look through 10,000 chromatographic peaks - individually, manually - just to get through one batch of results. Scaling that up to a more real-world example thousands of samples a day; 150 compounds - and the volume of work becomes staggering, and difficult to consistently review, every time, on time’. Victoria Zhang, the Founding Chair of the newly formed Mass Spectrometry and Separation Sciences (MSSS) Division at AACC , states that ‘the current labour-intensive and time-consuming process of mass spectrometry is one of the major huddles that have prevented labs from adopting MS at a much faster rate. Automation of sample preparation, data processing and results reporting will encourage hospitals to view MS as a critical solution for better serving their patients and accelerate integration into their labs.’. Zhang explains that ‘while it is hard to get a MS capital budget approved in hospitals, alternative means such as leasing have gained traction recently as a viable means for clinical labs to gain access to this powerful platform’. The cost, real or perceived, of MS is a major barrier in its deployment. Simplification of the technology, however, is bringing costs down. Randy Julian CEO of Indigo BioAutomation explains that ‘while the cost of the instrumentation may be perceived as high in an absolute sense, in terms of its relative value and return on investment, there are medically necessary tests, critical to patient care, for which MS is uniquely capable’. Both Tecan and Indigo highlight two major areas where training is lacking: sample preparation and data handling. ‘Laboratory robotics companies have responded to industry needs for more automated sample preparation, while LC-MS instrumentation vendors have responded to those same needs by developing more performant, reliable, and robust ways to acquire data’, comments Julian. “Pairing hardware automation such as this to advanced data handling and software automation is the best way to reduce end-to-end costs, while maximizing productivity and quality.” Kuzdal added that ‘I believe that mass spectrometry does save a lot of the costs and as users begin to go from one or two applications…that’s when you really get your moneys worth out of that one platform…it’s the way you utilize that’. Historically, MS vendors have focused on the life science market, such as proteomics, where users were more experienced in using MS and the technology was often the only viable solution to their challenges. In contrast, vendors have had challenges selling to the clinical market due to their lack of knowledge of clinical, or experience in talking to this audience. Zhang states that ‘most vendors are not familiar with the clinical market and the unique concerns related to clinical lab operations and underestimate the staff training and regulatory requirements in a clinical setting’. Shroff added ‘Understanding the customers’ value chain and bringing a superior working experience for the customer, along with providing the desired financial value, is key for further adoption of both automation and MS technology in the clinical industry. Vendors need to better understand the business drivers of diagnostic labs and offer solutions to their core business concerns. Today, labs aren’t looking for vendors who sell hardware and software, they are looking for partners who can help them be successful in what they do and do so better than their competition’. The lack of vendor experience in selling to this market produces the by-product of much less dialogue and collaboration between, not just industry and vendors, but also regulators. ‘It seems likely that clinicians will continue to hear about its enormous analytical effectiveness, but not embrace MS fully into routine because they know that it comes with complex workflows that do not fit into the typical clinical laboratory or the flow of patient care’, explains Lewtas at Bruker. In addition, the market is increasingly unhappy with the performance of existing techniques used in the clinical laboratory. Kuzdzal states that ‘immunoassays are good, but not perfect’. Immunoassays are ‘prone to wrong results – both false positives and negatives’ explains Schroff. ‘They typically cannot detect analytes at very low levels and cannot offer multi-analyte single assays’. Furthermore, whilst MS used to be a large, time-consuming and error prone technique, the advances in bench top models that work at the touch of a button, have resulted in more automation and less skill required. Other developments in MS technology and techniques that are fuelling the uptake in a clinical setting are highlighted below. 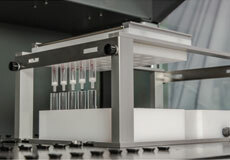 Sold Phase Extraction is a widely used sample preparation technique by which compounds of interest are extracted from complex biological matrices, prior to LCMS analysis. Clinical and toxicological laboratories performing medicolegal and biochemical testing, CRO’s doing bio-analysis and bioequivalence studies as well as food labs performing contaminants/adulterants testing – all use SPE cartridges. SPE is typically a time-consuming and manual process prone to human errors leading to additional time and costs for labs to repeat tests. In addition, the slow nature of the SPE process leads to underutilization of expensive LCMS instruments, putting more pressure on lab managers who are already struggling to show faster ROI’s and shorter payback times for their lab instrumentation. The Freedom EVO® positive pressure SPE workstation allows complete process automation of SPE workflows involving industry standard 1, 3 and 6mL SPE cartridges. The system offers significant benefits over the manual methods which is the status-quo for most laboratories. Time savings – The end-to-end process automation from primary samples to LCMS ready samples in vials reduces the time needed for sample preparation by at least 60-80% (other manual tasks can be done in parallel). Cost savings – Total process automation means there is a massive reduction in human-error induced repeat tests, thus lowering running costs for labs in terms of solvents, reagents and cartridges/consumables. In short, it enables labs to do more with less. ROI in LCMS investments – Shortened sample preparation time allows labs to analyse more samples on a daily basis on their expensive LCMS investments. This can enable lab managers to demonstrate a faster payback time and ROI for their LCMS investments. SPE performance - Positive pressure is applied independently via individual liquid handling channels to each sample, allowing much greater control (flow rate) than a vacuum station. This results in reproducible SPE extraction with negligible dead volumes. Data traceability – Use of barcode scanning for samples allows the system to work with LIMS worklists ensuring sample traceability. Additional software features allow for monitoring of all sample transfer and extraction steps providing excellent chain-of-custody to labs working in regulated environments. Health and safety - Limiting direct contact of the technicians with specimens and chemicals also enhances their safety, limiting their exposure to potentially harmful materials. In addition, hands-free automation reduces the risk of repetitive-strain-injury (RSI) for laboratory operators. Simpler training regimes – Laboratories working in regulated environments spend a significant amount of time and money training new lab personnel to operate the instrumentation and maintaining the required training documentation. The Freedom EVO Positive Pressure SPE workstation can be operated via a user-guided software interface called TouchTools™. The interface is tailored to individual laboratories application needs meaning running your applications can be as simple as entering the number of samples and pressing ‘RUN’. This ensures that new personnel in labs require minimal training and also reduces the need for extensive training documentation. Employee engagement – Labs are challenged with providing their staff with engaging tasks to enhance their job satisfaction, thus limiting attrition. However, trained scientists and technicians carry out non-engaging, repetitive tasks such as SPE leaving them under-utilized and dissatisfied. Sample preparation automation would allow lab managers to engage their talented staff in more intellectual tasks while the robot takes care of the repetitive sample extraction procedures. This translates to better utilization of talent as well as higher employee satisfaction. Shimadzu’s Liquid Chromatograph Mass Spectrometer (LCMS-8050 CL) triple quadrupole LCMS/MS incorporates proprietary ultrafast technologies as well as an ion source and collision cell technology. The LCMS-8050 CL features high sensitivity, high data quality and the world’s fastest data acquisition rates. It meets the growing demand for trace-level quantitation in clinical in vitro diagnostics and other markets. Acquisition occurs so rapidly that MS/MS scans and MRM measurements can be performed concurrently while maintaining quantitative accuracy. MS/MS scans at 30,000 u/sec, combined with high speed polarity switching equates to higher clinical lab throughput and enables positive and negative analytes to be measured in a single run. This reduces the cost of operation significantly. ASCENT is a hosted platform that automates the processing, reviewing, and reporting of LC-MS/MS data. The software enables an enormous acceleration of certified result release - including auto-release - through a variety of advances. Proprietary, patented technical insights in peak processing address the complex nature of high-throughput LC-MS/MS analysis in biological fluids. Review operations, as required, are focused on rapid visualization of relevant exceptions, identified by a customizable quality rules engine. When finished, ASCENT can securely and automatically make results available to the LIS, as well as present dashboards of laboratory operations and performance. Bruker’s MALDI Biotyper Microbial Identification system was introduced as a ‘research use only’ product in 2007. Hailed as revolutionary in clinical microbiology, The MALDI Biotyper is a next generation microbial identification system based on MALDI-TOF mass spectrometry. It allows an unbiased identification of microorganisms and delivers MS in an easy to use, rapid, robust, high-throughput, cost-effective and efficient package that matches clinical workflow and meets the needs of patients. Importantly, everything was designed by a team with a singular purpose: no specialist MS knowledge would be required and training and implementation in the lab would be no more complex than other clinical analyzers. With turn around times of minutes rather than hours (or days) and running costs that can be between 50% and 90% less expensive than traditional tests, this is a perfect match of technology, methodology and cost efficiency. The hemaPEN™, a novel prototype blood collection and storage device, is the first product concept from ASTech, the ARC Training Centre for Portable Analytical Separation Technologies – a $5.2 M program part funded by the Australian Research Council (ARC), University of Tasmania (UTAS) and Trajan. DBS technology is traditionally used in new-born screening but the limitations of current delivery formats have stalled the broader adoption of DBS for routine blood analysis. It can be difficult to correctly place a drop of blood onto the traditional card format; and the amount of blood isn’t measured so quantitative analytical work is limited. The card itself can become contaminated through mishandling; and, if the DBS on the card is to be ‘punched’ to create a sample disk for analysis, then the location of the punch within the spot is often not representative of the blood sample. hemaPEN is a hugely exciting development as it directly addresses these limitations. Trials of the device with patients are due to start soon.